Around The Bunkhouse / Standard Route on Whitehorse, and the dreaded Brown Spot! Standard Route on Whitehorse, and the dreaded Brown Spot! It is rock season in New Hampshire and the stoke is high! Book your adventure today. But for now, enjoy this past report from David Lottmann. This past Wednesday Oliver returned for some more preparation before his Yosemite trip next month. We started the day with a full length route up Whitehorse via Standard Route (1080ft, 9 pitches, 5.7). 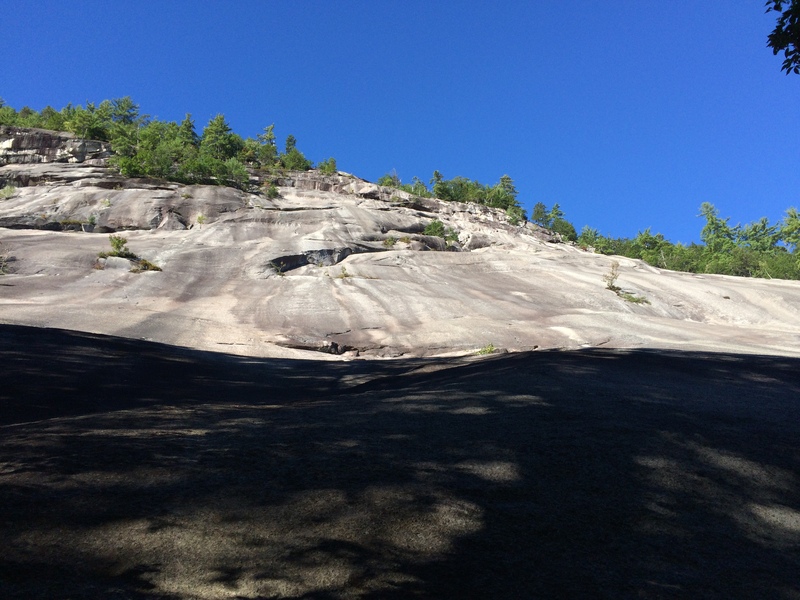 65 degrees, sunny, light breeze… perfect climbing weather…and we had the whole cliff to ourselves all morning! We quickly climbed up to the Crystal Pocket. After a quick snack on Lunch Ledge I decided to climb the original “Brown Spot” 5.5 variation since I always take the Slabs Direct 5.7 variation. I quickly discovered why I never take this variation. The bolt protecting the move is one of the nastiest old 1/4 inches I’ve ever seen. The climbing itself doesn’t feel any more secure than the 5.7 variation. I stopped a little higher on the next ramp to belay to keep the rope drag down, and while I thought replacing the bolt might be a good community service I think it’s probably better to just stick to the direct finish. It’s MUCH nicer in every possible way. It was only 12:30 so we ate some lunch and made our way down the hiking trail. Oliver was interested in going over some of the various anchor strategies we used on this climb so we drove over to The North End of Cathedral Ledge. There we spent a half hour or so going over some new and old techniques of constructing anchors. To wrap up our day we took a quick spin on Child’s Play, the fun 5.6 crack climb, then headed back to the shop. Oliver’s got a couple more days planned with me this Fall before his Yosemite trip and is getting a few training days in at the tres-new Salt Pump Climbing Co. gym that recently opened in Scarborough, ME. If you are Downeast you should definitely check this amazing climbing gym out! David has devoted his entire adult life to climbing – pushing his grade on recreational objectives and working as a professional mountain guide. After a stint in the United States Marine Corp, he was hired as a rock and ice instructor and since has expanded his repertoire to include alpine, skiing and avalanche education. David is an aspirant Rock Guide through the American Mountain Guide Association [AMGA], an Ortovox Team Athlete, an expert gear tester at the Gear Institute, an American Institute for Avalanche Awareness and Education [AIARE] Course Leader, holds a Wilderness First Responder [WFR] and is a volunteer member of Mountain Rescue Service [MRS] and Androscoggin Valley Search and Rescue [AVSAR]. 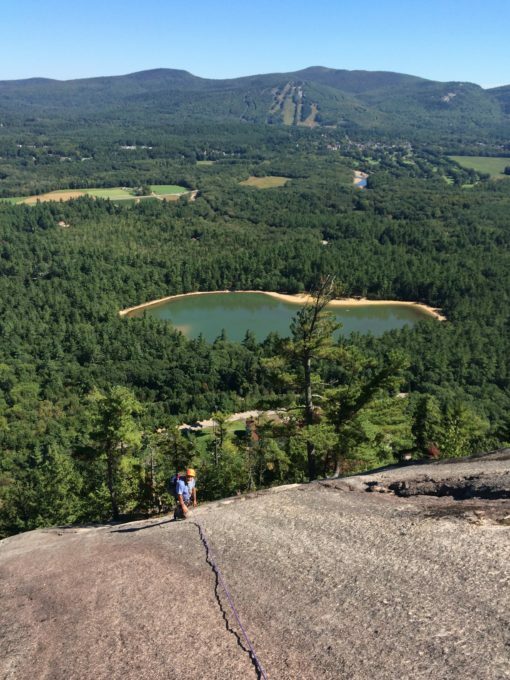 In his free time, you will find David blogging, mountain biking, kayaking, hiking, skiing, sharing micro-brews with friends or in the kitchen working on a new recipe in his home town of Conway, New Hampshire. He resides there with his wife, Michelle, his son, Alex and daughter, Madalena.